Ultra-low Temperature Freezers Market size is set to exceed USD 315 million by 2025; according to a new research report by Global Market Insights. Increasing disease burden globally is the key factor that will drive ultra-low temperature freezers (ULTF) market during the forecast period. Growing focus of companies on development of novel drugs coupled with numerous clinical studies involved in the process will boost adoption of ultra-low temperature freezers for efficient storage of biological samples. Furthermore, growing healthcare expenditure and rising demand for advanced treatment has accelerated demand for new medicines delivering enhanced quality, reducing hospitalization and side effects. Thus, growing demand for personalized medicines, advanced treatment and technological advancements in research tools will favor ultra-low temperature freezers market growth. Moreover, awareness regarding significance of genomics in human health is increasing over the recent years. Increasing funding towards genomic research activities to study role of genes associated with disease will favor business growth. Technological advancements in high-throughput biochemistry and bioinformatics assisting genomic research project will further propel industry growth. However, high cost and stringent regulatory issues regarding ultra-low temperature freezers market may impede industry growth over the forecast period. 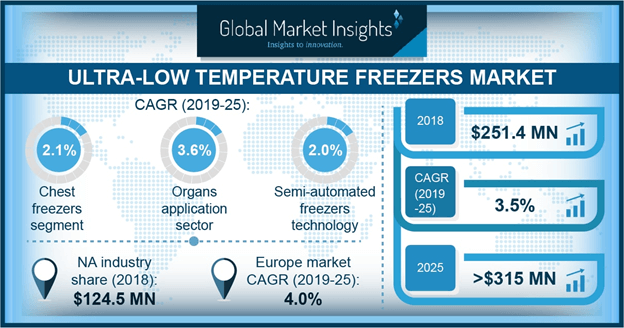 Upright freezers dominated the ultra-low temperature freezers market with USD 228.3 million in 2018 and is anticipated to show similar trend over the forecast period. Technological advancements in upright freezers leading to high adoption along with enhanced accessibility and operation management favors segment growth. Rising demand for upright models with versatile storage systems, pull out baskets and removable or adjustable shelves will further spur the segmental revenue. Blood & blood products application segment held 33.4% revenue share in 2018 and is anticipated to show considerable growth over the forecast period. Demand for blood and blood products is alarmingly rising due to increasing number of surgeries worldwide. Medical emergencies such as severe blood loss during child birth, accident and trauma cases that require blood in abundant quantity will augment ultra-low temperature freezers industry growth. Automated ultra-low temperature freezers segment accounted for considerable revenue in 2018 and is estimated to witness 3.8% CAGR during the forecast period. Segmental growth is attributable to growing demand for automatic ultra-low temperature freezers in biobanks and laboratories for storage of high value samples. Automated freezers eliminate freeze-thaw cycles and limits entry of moisture into the system. Such benefits will surge adoption of automated ultra-low temperature freezers in the foreseeable future. U.S. ultra-low temperature freezers market dominated North America region and was valued at USD 111.1 million in 2018. High adoption of ultra-low temperature freezers in laboratories coupled with rising investment by private and public organizations in new drug development and other research activities will drive regional growth. Numerous efforts undertaken by the U.S. Environmental Protection Agency (EPA's) and U.S. Department of Energy (DOE) to augment adoption of ULTF will drive business growth over the analysis period. Moreover, presence of major industry players will further boost the U.S. ultra-low temperature freezers business growth. Germany ultra-low temperature freezers market is estimated to show lucrative CAGR of 3.8% over the analysis timeframe. Rising genomic research activities, presence of large number of biobanks coupled with rising number of blood donations will favor business growth. Growing number of plasma and red blood cell transfusions in the country will further drive ultra-low temperature freezers industry growth. Prominent industry players operating in the ultra-low temperature freezers market include VWR International, Azbil, Binder, Eppendorf, Arctiko, Haier, Panasonic Healthcare Corporation of North America, ESCO MICRO PTE, EVERmed, Stirling Ultracold, Thermo Fisher Scientific and Helmer Scientific. Industry competitors adopt certain strategies such as mergers, acquisitions and new product launch that helps them in sustaining their market position. For instance, in May 2017, Eppendorf introduced new CryoCube F740 series, that ensures longevity, sustainability as well as quality. Development of such advanced models with high storage capacity enhanced company’s product portfolio and broadened its customer base.